Thai Union, one of the world's largest seafood conglomerates, said Tuesday it will overhaul its fishing practices to protect against labour abuses and unsustainable trawling, a move hailed by Greenpeace as "huge progress". 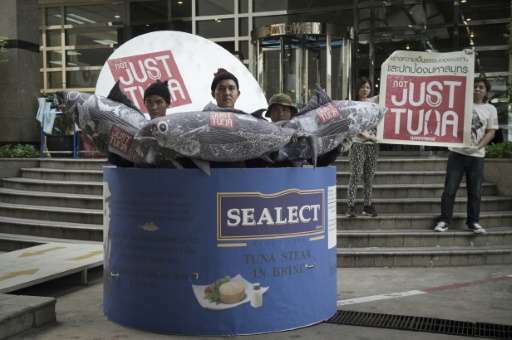 The Thai food giant—which owns major global brands such as Chicken of the Sea, John West and Petit Navire—has long been a bete noire to those campaigning against overfishing and abusive working conditions on boats. But on Tuesday it released a joint statement with Greenpeace announcing a series of reforms that both said should encourage other seafood behemoths to follow suit. "This marks huge progress for our oceans and marine life and for the rights of people working in the seafood industry," Greenpeace International Executive Director Bunny McDiarmid said in the statement. "Now is the time for other companies to step up, and show similar leadership." Among the commitments Thai Union has made is to cut the number of fish aggregating devices (FADs) it uses by 50 percent by 2020 and reduce longline fishing. FADs, which float on the surface to attract fish, and longlines are effective ways of catching large hauls of lucrative fish like tuna. But they often result in reams of other animals being caught, including endangered sharks and turtles. The reforms will also target working conditions on board Thai Union boats and those of its suppliers including an extended moratorium on "transshipping". Transshipping is a method many fishing giants use to keep trawlers at sea as long as possible, often for years at a time. Catches are transferred to refrigerated transport vessels at sea, saving the time and fuel costs of returning to port. While economically efficient, environmental groups have long warned that transshipping allows trawlers to hide illegal catches and often leads to slavery-like conditions for many of the low-paid fishermen who spend years onboard their boats. Thai Union have also agreed to allow independent observers or digital tracking devices onto all their longline boats and will meet with Greenpeace every six months to assess implementation. In the joint statement, CEO Thiraphong Chansiri said his company "has fully embraced its role as a leader for positive change as one of the largest seafood companies in the world." Thai Union posted worldwide sales of $3.8 billion in 2016 and is targeting $8 billion revenue by 2020. Thailand is the world's third largest seafood exporter but the industry has been dogged by allegations of rights abuses and cheap labour in its fishing fleets and many food processing factories. The sector is mainly staffed by poor migrant workers from Myanmar, Laos and Cambodia. The European Union has threatened to ban all its seafood products unless the military government tackles rampant illegal fishing among its fleets.